With summer break coming to an end, it’s a good time to plan a last escape. Not a long summer vacation, but a short family getaway before facing the stringent school year schedules. Located on Florida’s Historic Coast, the ancient city of St. Augustine provides the perfect family getaway destination, offering the best of Florida beaches and family-friendly attractions. And they’ve had plenty of practice, with hospitality to visitors dating back to 1565, when Ponce de Leon landed on the shores. America’s Oldest City is accessible by foot, but for new-comers, families with little ones, and the hiking weary, the best way to explore the is via the hop-on hop-off trolleys that run throughout the ancient city. Not only do they provide you with an in depth guided tour of the history and city attractions, but they also give you the the opportunity to leave your car behind, saving time-worry of the meter running out and leg work. 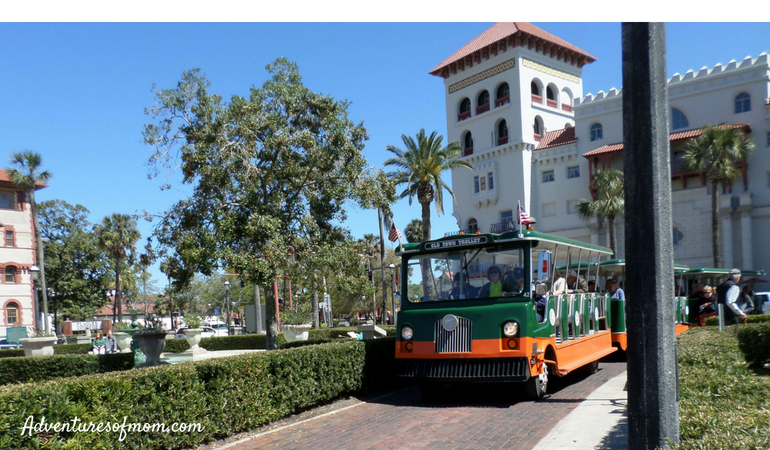 If you are a new visitor to St. Augustine, take the full trolley tour around the town to get your bearings of the city, then decided where to get off. Make use of the city map provided during your walks, and so you will know which stop you may want to use the trolley again. Some stops, like the Whetstone Chocolate Factory, the Fountain of Youth, and the Old Jail, are a good distance from the rest of the old town, and you’ll be grateful for having that trolley pass. Other places, like the city gate and the fort, are so close that you may not want to use it there. Family Tip: Have young kids? A full ride on the trolley is a good time to nap for young kids and gives parents some downtime too. You can leave your car at the Trolley Tour main offices for the duration of the tour day, use the system via your hotel if you are in their running network of stops, or choose to make use of the old city’s parking garage for all day parking. The parking garage, located behind the city’s visitor center is $15 a day- yes, it sounds steep (unless you’ve faced parking fees in New Orleans), but the metered parking around the city ($2.50 per hour) limits you to a 3 hour maximum. The Downtown Parking Garage is located at 11 Cordova St., St. Augustine, FL 32084. We used the Old Town Trolley system during our stay. They offer 1-2 day hop-on, hop-off passes. Old Town Trolleys provide 23 different stops and extensive information booths throughout the city. They also have an additional shuttle bus from Aviles St. that connects Anastasia Island stops like Alligator Farm, the St. Augustine Lighthouse, the beach and various island hotels with the oldest city. Old Town Trolleys run from 9am-4:30pm, with trolleys running every 15-minutes. 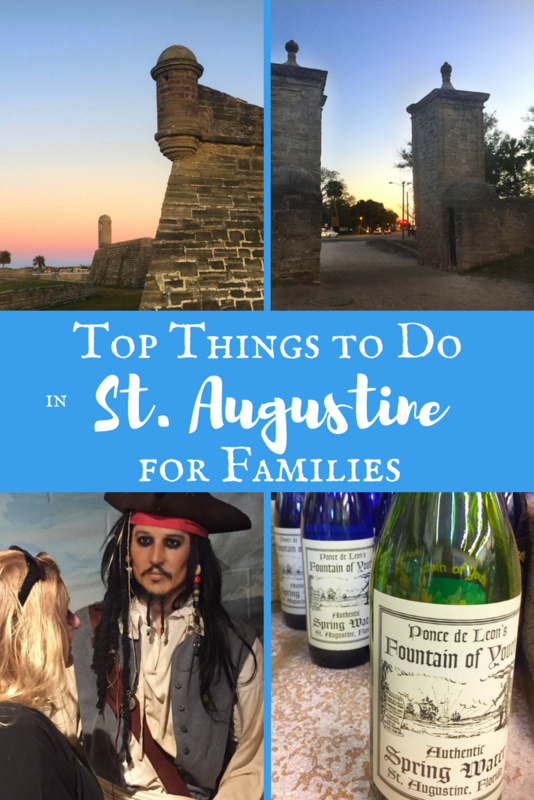 They also offer free admission to the St. Augustine History Museum and additional discounts to other St. Augustine Attractions. Contact number: 904.829.3800. 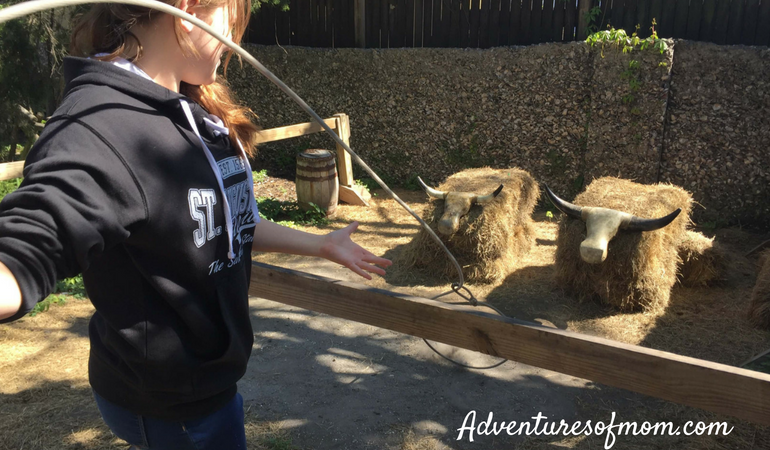 You won’t find any roller coaster thrills of Orlando’s big theme parks in this historic town, and if the thought of touring historic colonial homes is too sedate for your active family, St. Augustine offers it’s own type of thrills and chills to get your adrenaline surging. 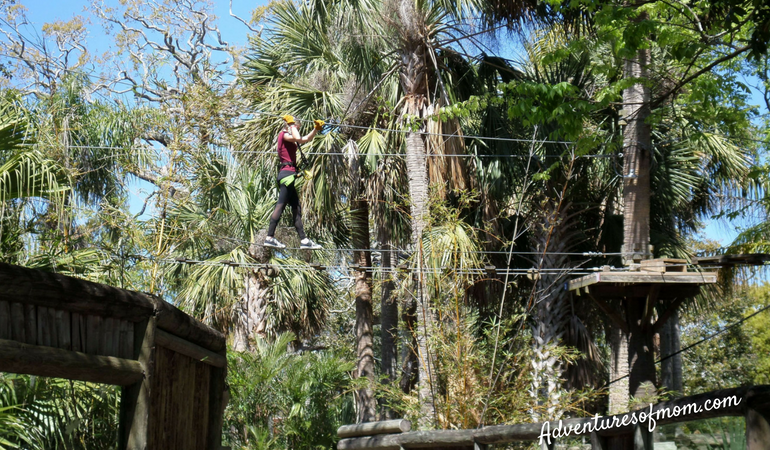 Head over the Bridge of Lions to the St. Augustine Alligator Zoological Park and zip line over alligators and crocodiles from around the world. The Crocodile Crossing zip line & aerial obstacle course attraction offers two courses, the Nile River Course, with 17 zip-lines and their Sepik River Course of 9-zip lines. You can also tackle a 40-foot free-fall at their Python Challenge. After your high-adventure, you can choose to visit the St. Augustine Alligator Farm (Included in Nile River Course purchase or discounted admission with Sepik River Course purchase). If you’re a visitor to Florida, or just curious about reptiles, this is the place to go. Come face to face with a live 15 foot, 9-inch crocodile, Maximo. Find out just how big our Florida alligators can get and how high they can jump in the wading bird rookery and alligator swamp, where gators vie for food and sunbathing rights. See the rare albino alligators, snakes (including a cobra! ), Madagascar lemurs, tour the land of the crocodile, and be sure the check out their newest attraction: Oasis on the Nile. Family Tip: Have little kids? This attraction is stroller friendly & family-friendly. There is a playground perfect for little ones to run off their energy and shady places for rest. St. Augustine Alligator Farm Zoological Park is located at 999 Anastasia Blvd, St. Augustine, FL 32080. Their contact number: 904.824.3337. They do offer ticket discounts on their website. Parking is free. They have quite a few live-animal shows here. 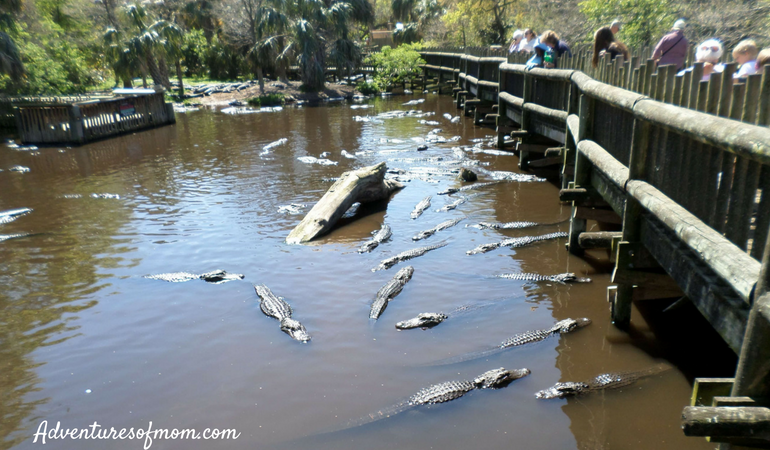 During our visit we caught the Live Alligator Feeding at the Alligator Swamp, and seeing our Florida alligators swarm and jump for food is an incredible sight, and can give you and the kids an appreciation for these native reptiles with whom we share our Florida waterways. Find out the show times when you arrive and get there early. The birds in the trees above the alligator swamp (nearest the Gomek Forever exhibit) were numerous when we were there and can poop on you. Find a space on the boardwalk well away from those trees! 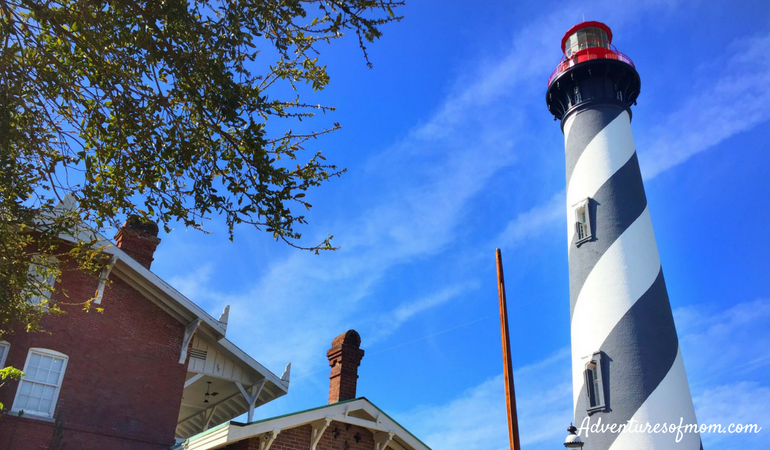 Though zip-lines don’t dangle from the city’s historic lighthouse, you can climb the 219 steps of St. Augustine’s tallest building for a view of St. Augustine and the nearby Atlantic Ocean at the St. Augustine Lighthouse and Maritime Museum. Located on Anastasia Island, the Victorian light station has up-dated, keeping the little-ones in mind. Although kids must be at least 44 inches tall to climb to the top of this working lighthouse, the smaller kids aren’t left in the dust. There is an onsite playground, the Shipyard Play Area, made just for little kids. If the Florida heat gets too much, or the weather turns foul, escape to the Legends of the Light exhibition in the nearby Maritime Museum, where kids can try their hand at etch-a-sketch or play in the puppet theater. Grab a scavenger hunt card before heading on the Maritime Hammock Trails through the woods around the lighthouse for a nature hunt, or explore the historic Keeper’s House. Family Tip: 219 steps tackled by younger kids (and teens!) can easily put an end to your sight-seeing day. Plan a later in the day visit (check their daily schedule on their website first! ), or plan a time of day when you can head back to your hotel afterwards for a break or pool swim. Of course, the beach is only a few minutes away too…. The St. Augustine Lighthouse & Maritime Museum is located a 81 Lighthouse Avenue, St. Augustine, FL 32080. Their contact number is 904.829.0754. Their on-site parking is free. Visit their website for discounts & coupons. We were surprised at the updates inside the lighthouse on our recent visit. Each landing is filled with little known facts on the walls, a great read and perfect excuse to stop and catch your breath. The St. Augustine Pirate & Treasure Museum provides the perfect retreat from our Florida weather. Life-like animatronic pirates help to make this stroll through the history of piracy a favorite Old City attraction among kids and wanna-be Gasperilla-adults alike. Hands-on exhibits encourage you to open drawers, tie ropes, take in the sights and sounds of what life was like when Blackbeard, Calico Jack, Anne Bonny, and Robert Searle terrorized the seas during the golden age of piracy. Included in the array of exhibits is a real treasure chest and gold, as well as a one-room nod to the Hollywood figures who have kept the ‘golden’ part of the pirate legacy alive. Family Tip: Kids can grab a scavenger hunt map and look for various hidden ‘treasures’ throughout the museum. The St. Augustine Pirate & Treasure Museum is located at 12 South Castillo Drive, St. Augustine, FL 32084. Although there is no parking, it’s just across from the Castillo de San Marcos (metered parking). Their contact number is 877.467.5863. During the Below Deck sound experience of Blackbeard’s last battle, the room is dark and you wear headphones and listen to the clashing of swords and more…, but little kids and some adults even, can find this realistic soundtrack disturbing. St. Augustine’s coquina fort, Castillo de San Marcos, dates back to 1672, and replaced the earlier wooden fortifications burnt down by raiding pirates (not once, but twice!). 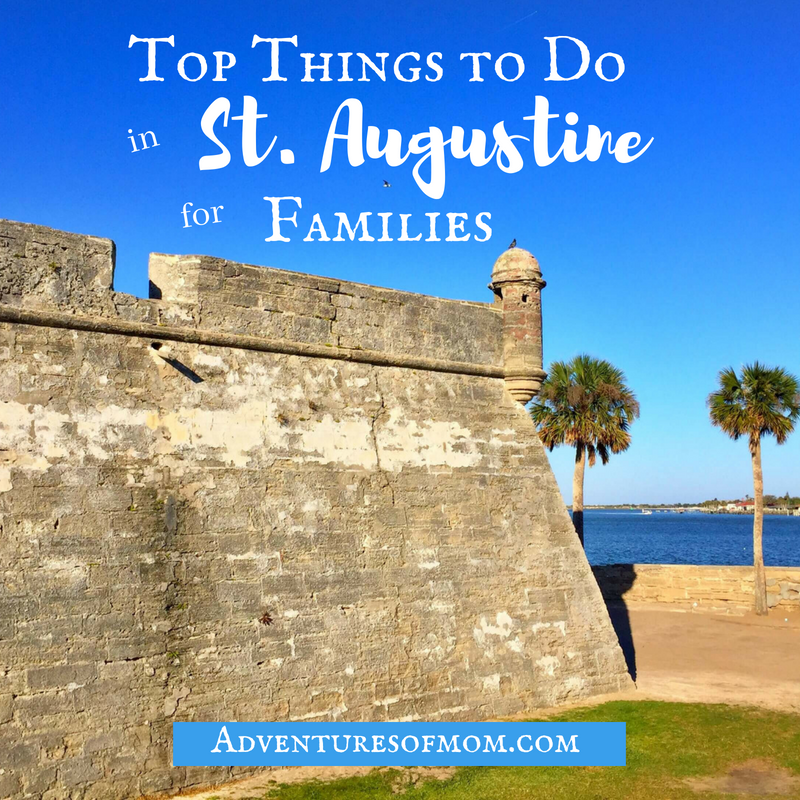 The Castillo is St. Augustine’s crowning jewel, and a must-see for families. Wander through the soldiers’ barracks, chapel and ammunition room, then take the steps to the top floor for a look at the cannons, watch towers and view of Matanzas Bay. If you’re lucky, you may even see the canon being fired. The Castillo is $15 for ages 16+, but you ticket is good for 7 consecutive days. 15 and under are free, but must be accompanied by an adult. Family Tip: On a budget? You don’t have to pay to walk around the outside of the fort. The moat is grass, and there are steps leading into it at different areas, but be warned, there are no hand rails, so watch those kiddos! The greens around the fort are a good place to relax during the day and return to at sunset. Castillo de San Marcos is located at 1 South Castillo Drive. 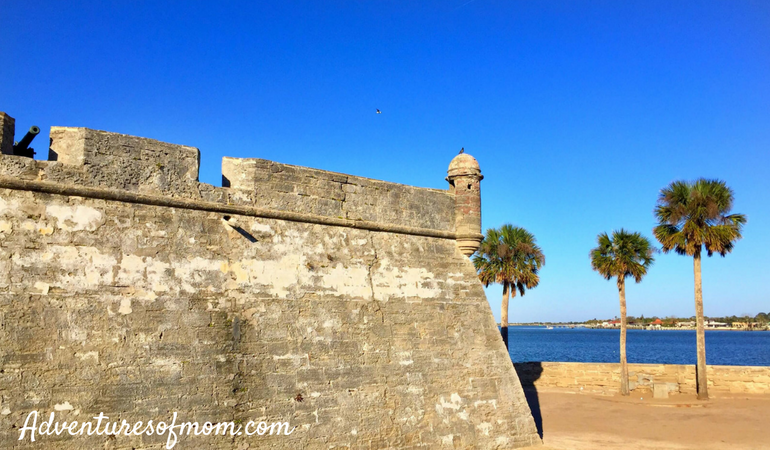 Read more about our explorations at Castillo de San Marcos. The Colonial Quarter was renovated a while back, keeping kids and St. Augustine’s history in mind. Though you can explore the different areas of the quarter freely, they do also offer guided tours throughout the day. Family Tip: This is a good place to let your stroller-bound little ones stretch their legs (under parent’s watchful eyes, of course), while the older kids ‘play’, but be warned as during the school year this is the place those school trips descend upon to learn all about history in America’s oldest city. The Colonial Quarter of St. Augustine entrance is located at 43 St. George Street. Contact number 888.991.0933. Be sure to pick up a map on your way in for their scavenger hunt. Escape the heat or afternoon rain in Potter’s Wax Museum, where you and your kids can take the perfect selfie with your favorite stars. With silver screen stars and history legends, it a good place to take an hour’s chill. Potter’s Wax museum is located at 31 Orange Street, near the St. Augustine Visitor’s Center & City Parking Garage. Check out their website for special offers & discounts. 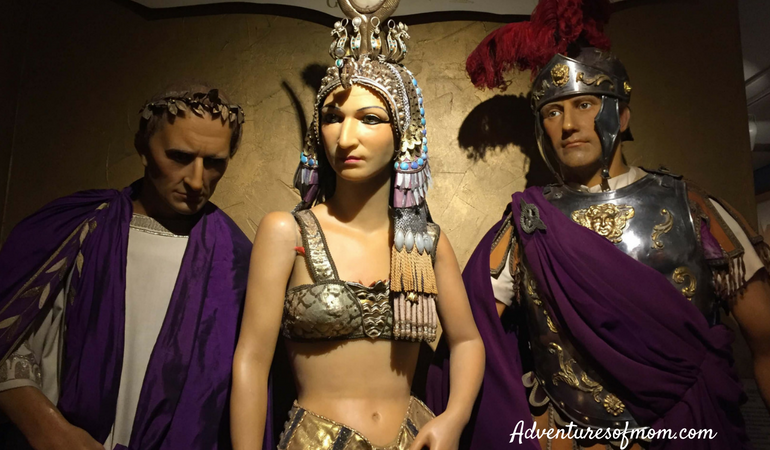 Read more about our trip to America’s Oldest Wax Museum. Looking for an escape from the heat and rain? This 45 minute tour of St. Augustine’s Chocolate factory is a great way to avoid the elements while learning about how America’s favorite confection is created. Sampling is included- and encouraged! 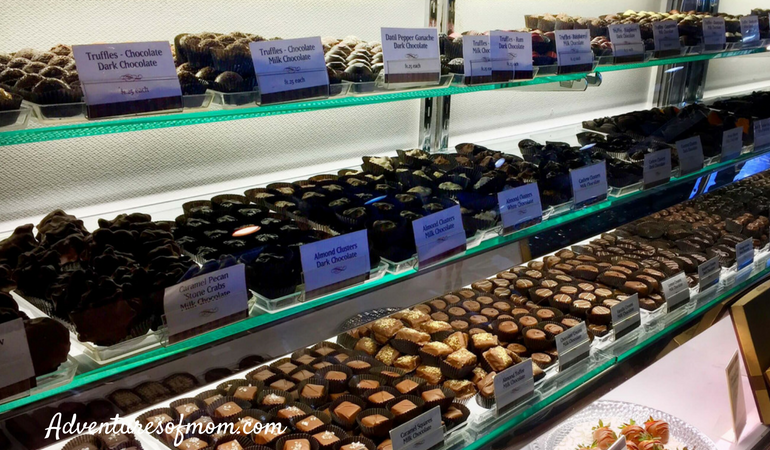 Read more about the Whetstone Tour at Whetstone’s Chocolates: St. Augustine’s Sweeter Side. 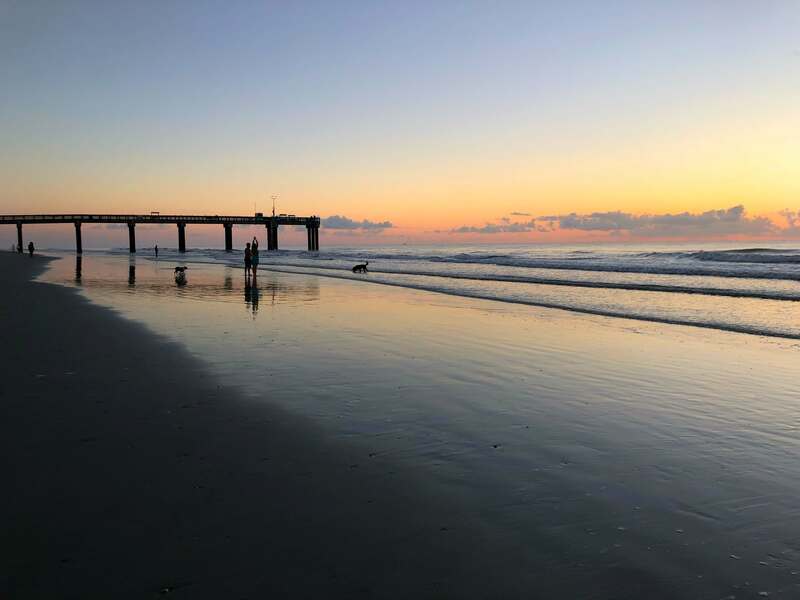 The beach is never far away in St. Augustine, and it’s the perfect way to spend the day, or even just a few hours. Vilano Beach is located north of historic downtown, over Vilano Beach Causeway. Vilano Ocean Front Park is a good shark-tooth hunting beach. You can head south on the beach to get a view of Matanzas River and the historic city. This beach is free and has a changing room/toilet and outside shower. Head over the Bridge of Lions south to find Anastasia State Park. Here you will find a long stretch of sandy beach the runs around the opposite side of Matanzas inlet. Changing rooms, toilets & outdoor showers, along with bait shop. You can also camp at this state park. Anastasia State Park is located at 300 Anastasia Park Road. It’s $8 per vehicle (2-8 persons) for this park. Read more about this park at Adventures at Anastasia State Park. Head past Anastasia State Park south and follow the signs out to the beach. Public parking is free. There’s changing rooms, toilets & outdoor shower, a covered playground and splash pad for the kids and a fishing pier. The pier is $4 for fishing, $1 for sight-seeing. Beach and parking are free. This is one of the more popular beaches, so parking goes fast. 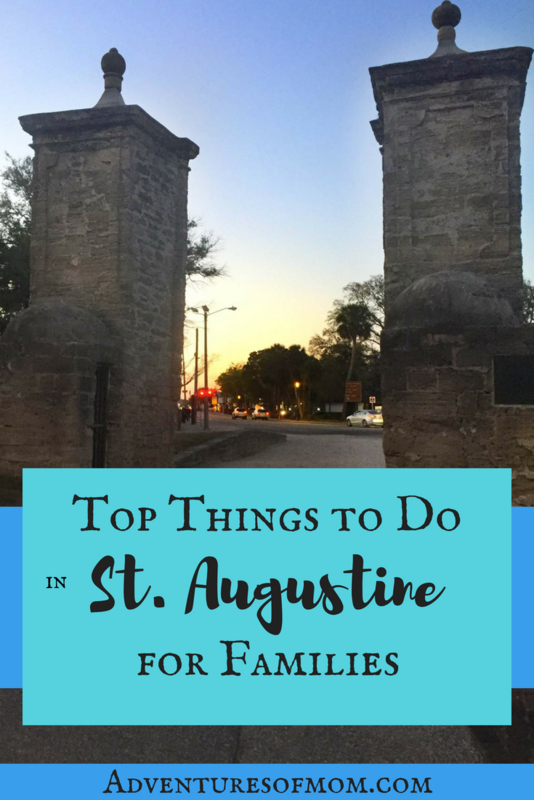 For families with older kids, St. Augustine offers many night time ghost tours throughout the old city. Most of these are walking tours, like the Ghost Tours of St. Augustine, while others offer trolley rides, like the Old Town Trolley’s Ghosts & Gravestone Tour, where you get the chance to explore Potter’s Wax Museum and the Old Jail after hours on the tour. 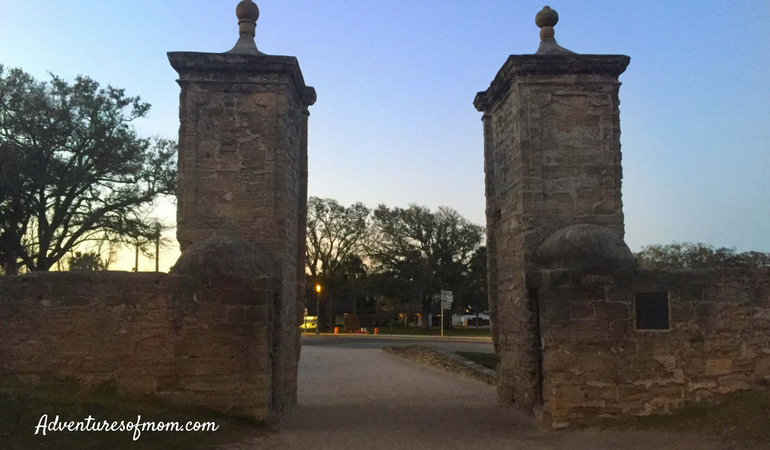 Though ghost tours are not for everyone, each one is different and they do make a fun night out in the old town of St. Augustine, whose attractions close notoriously early. These ghost tours are ‘not’ for little kids. We took a walking ghost tour with Ghost Tours of St. Augustine. It was a busy tour, so call ahead and make reservations. Our guide took us from their main office near Lightner Museum & Flagler College and ended the tour near the main city gate near the Castillo de San Marcos. Luckily we knew this would be the route ahead of time and had our car parked in the nearby city parking garage by the visitor’s center. If you leave your car by Flagler College, you have to walk all the way back. Plan ahead. There are plenty of restaurants around St. Augustine to choose from. O.C. White’s for seafood by the marina. Harry’s on Castillo Drive- deep fried oreos…yum! 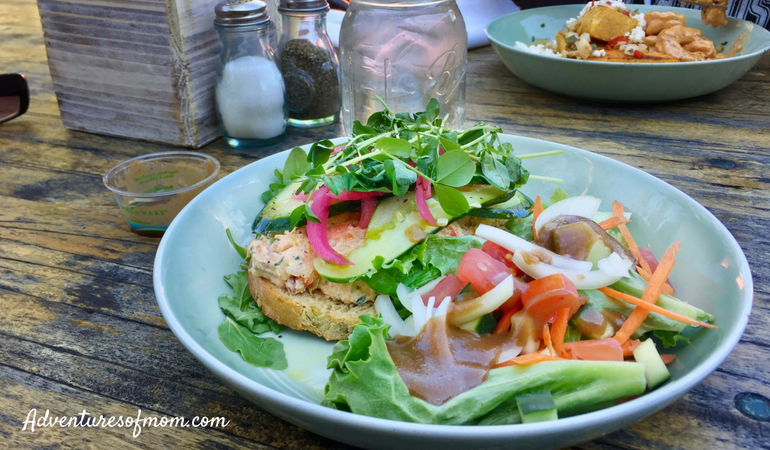 The Floridian on Spanish Street for vegan and local sourced dishes. Saltwater Cowboy for Florida food. The historic O’Steen’s on Anastasia Boulevard for seafood (cash only establishment). 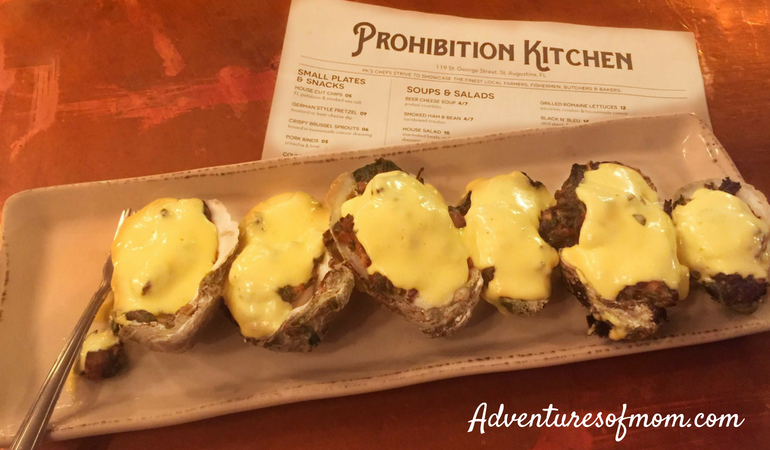 Prohibition Kitchen on St. George Street for burgers. Salt Life Food Shack on St. Augustine Beach for burgers & seafood- (and a really cool deck). Seafood at Caps on the Water on Vilano overlooking the Intercoastal waterway. Family Tip: Eat breakfast and have a late leisurely lunch as your main meal. The menu is usually cheaper for lunch, making it a budget saver for families. Pick up a St. Augustine Local Restaurant guide at the visitor’s center to help you choose. The Visitor’s Center, located next the city parking garage has toilets, museum displays, shopping and information and maps. On our recent visit, we grabbed coffee and hot croissants at the St. Augustine Coffee Shop (near the Oldest Wooden Schoolhouse) on St. George Street for breakfast. We had dinner at Prohibition Kitchen later that night. They had live music and amazing Oysters Rockefeller & burgers! The Sing It Loud Music Festival returns this September in St. Augustine, offering 3-weeks of free live musical performances at 19 different venues. Learn more about this music extravaganza in America’s Oldest City. Family-fun in St. Augustine. Isn’t it time to plan that last getaway with the kids? Do you have a favorite St. Augustine attraction? Let us know in the comments below.